Great interview with Jackie Douglas from LivableStreets about their Better Bridges campaign which could bring great improvements to our quality of life in Allston and beyond. A big thank you to the Boston University students who volunteered last Saturday morning to help clean up the Everett St Slope! It is always great to meet more neighbors who care about our community and are willing to give some time to help improve it. Western Avenue location, according to [BRA spokesperson Jessica] Shumaker." The City and Harvard could negotiate a reasonable price for the City to use its right of eminent domain to take the land needed for the extension of Telford Street. 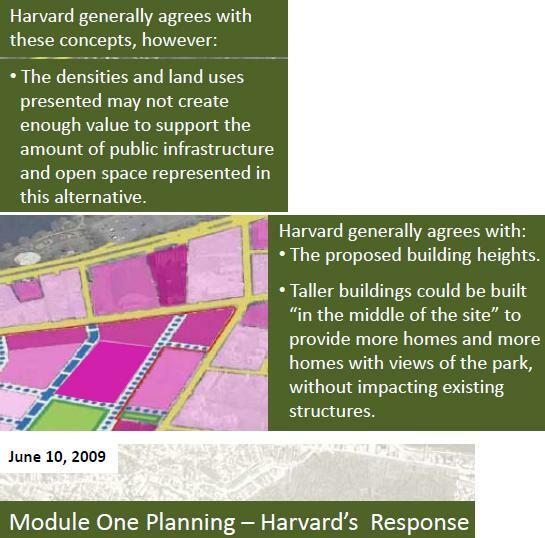 Maybe, in light of its impact on Allston and Brighton and its desire to help Western Ave someday gain the density needed to be a viable Main Street, Harvard would agree to allow the taking for $1 or 2. McDonald's, as a tenant, would have no ability to veto this agreement between Harvard (the landowner) and the City. Maybe then McDonald's would be willing to continue doing business in their exisiting building and reconfigure their parking and drive-thru so it can remain a "fixture on Western Ave."
BBJ takes a look at the Law School and Museum projects that continue at Harvard. Former state Sen. Jarrett Barrios is expected to announce his endorsement of Democratic state Senate candidate Tim Flaherty in the upcoming Sept. 14 primary. 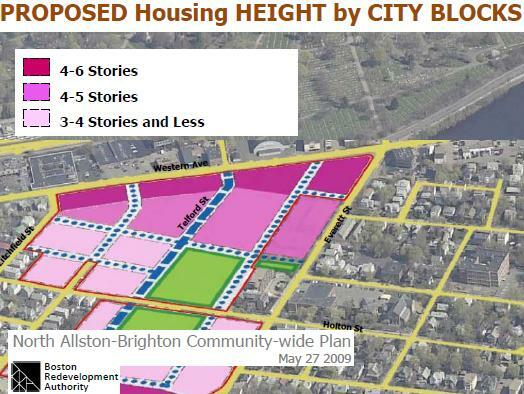 How about an "Allston Free Store"? Especially with many people about to move in and out of the neighborhood it would seem like there would be no shortage of people giving and taking. 50 Gardner St - Change the legal occupancy from a one-family dwelling to a lodging house. Story in today's Herald about Harvard's proposal for a new McDonald's at Brighton Mills. The quotes from Harvard and the BRA manage to avoid the issue that concerns many neighbors and that contradicts years of Harvard/BRA/community planning - to create jobs and economic and civic life on Western Ave, new construction should be multi-story mixed-use buildings, not one-story detached buildings like the proposed new McDonald's. This Friday-Sunday Harvard Habitat for Humanity is holding a Community Warehouse Sale at Habitat's warehouse in Allston. During the past several years, Harvard and the Boston Redevelopment Authority have explained to the residents of North Allston and North Brighton that our main street, Western Ave, needs new development much taller and denser that the one-story buildings that are currently on Western Ave. Many residents, who support a future for our neighborhood that includes more jobs, more opportunities for small businesses, and an improved 21st century community, have supported these plans while also stressing the need for transportation improvements and respect for residents who live on or near Western Ave.
Harvard University also spoke in support of multi-story new development, most recently and specifically in this June 2009 presentation. So how surprising that Harvard is now proposing to build a new, one-story, free-standing McDonald's fast food restaurant on Western Ave. Their proposal would demolish the existing Brighton Mills McD's and build a new one just a few yards closer to Petco. Some modification to the existing McDonald's building or parking/drive-thru area is needed to conform with the Charlesview plans to build new housing at the KMart/OfficeMax site. But this does not need to block the development that our community needs to breath some new economic life into our neighborhood. Interested in learning more? Please attend the community meeting on Thursday at 6:30pm at the Honan Library (300 North Harvard St). Please be careful out there on bike, foot, and car! While Harvard's Allston Work Team continues to search for a tenant to fill Harvard's vacant CITGO station, the Syracuse U. is helping build a stronger Syracuse , as described in today's NY Times. Syracuse has been particularly attractive to people like Mr. Destito thanks to a forward-thinking coalition that includes Mayor Stephanie Miner; Nancy Cantor, the chancellor and president of Syracuse University; Joanie Mahoney, the executive of Onondaga County; and a mix of neighborhood groups and business associations. The university has bought empty industrial buildings and renovated them, using some of the space for programs and renting out the rest. From "Syracuse as Anchor Institution"
The entrepreneurs who will drive economic growth and job creation through the 21st century increasingly will come from our cities, from groups whose talents have gone largely untapped. SU is catalyzing communities of experts locally, nationally, and globally to tap that talent, as evident in the following projects. Congrats to Union Square's Deep Ellum for making the New York Times "36 Hours in Boston"
Beer lovers, on the other hand, should head to Deep Ellum in Allston (477 Cambridge Street; 617-787-2337; deepellum-boston.com), an elegant pub with 28 taps that regularly rotate with Massachusetts breweries like Pretty Things Beer and Ale Project. Our Wednesday meeting is at 102 Litchfield St, home of Tim and Jane McHale. Hope you can join us.